Greetings from the Adventure Experts at Island Dreams Travel. 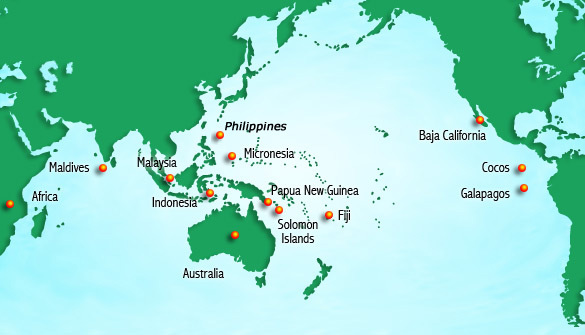 This portion of our website is designed to provide you with valuable information about the Indo-Pacific realm. Why should you invest the substantial time and money required to visit the dive sites of the Pacific Rim? The answer is measured in millennia, for the Pacific Ocean is many times older than the Caribbean Sea. As a result, the diversity of marine life in the Pacific is at least ten or twenty times greater than the Caribbean. To you as a scuba diver, that means more species of fishes, more color, more diversity, more abundant life swirling before your eyes. We invite you to follow the links below, where many exciting and rewarding adventures await you. Don't miss our Photo Galleries, or the opportunity to join Island Dreams on one of our professionally conducted Group Trips to experience the world's most unusual and exciting diving for yourself. A splendor of natural beauty, native cultures, and marvelous diving. With so many islands and resorts to choose from, the hardest part about going to Fiji is deciding where to go first. Consider visiting at least a couple of resorts, diving both the Northern and Southern regions. We can also arrange surf and turf packages offering the best of both land based and live-aboard diving. Our Fiji resorts bring you the most beautiful of natural surroundings, great diving, and first-class service.